5 Questions for the Client with Neuropathy. And What to Do with the Answers. It’s cold out, and your client keeps her socks on during her massage, leaving them for you to remove when you’re ready to work on her feet. As you peel off her left sock, you notice an abrasion on the ball of her foot, one she hadn’t noticed because of her loss of sensation. Later, feeling inside her shoe, you both notice the corresponding fold in the leather. Because of her diabetic neuropathy, she never noticed it, and it has worn away at the skin on her foot. Another client with HIV and neuropathy complains of burning pain in his feet that make it difficult to walk. He struggles to get to your office and heaves himself on your table, glad for some attention to his feet. Yet another client is struggling with tingling and numbness in her hands and feet. She is in chemotherapy, and praying the neuropathy will go away once cancer treatment has ended. Peripheral neuropathy disrupts the function of one or more peripheral nerves, causing changes in sensation or motor function. The term typically describes a disease or injury of one or more spinal nerves serving the hands, feet, or both. It can also affect the special senses or internal organs. Often termed “neuropathy” for short, the condition is usually a complication of another condition such as diabetes or HIV infection. It can be a complication of chemotherapy (chemotherapy-induced peripheral neuropathy or CIPN), B12 deficiency, excessive alcohol use, toxic exposure, or inflammatory conditions such as autoimmune disease. Symptoms often occur in the hands and feet, and range from a mild “pins-and-needles” sensation (parasthesia) or slight pain on up to debilitating pain. The pain often has a burning quality, and is worse at night. People with neuropathic sensation loss often describe it as having thin gloves or socks on that interfere with sensation. Motor weakness can also occur. To work well with neuropathy in the extremities, there are 5 questions to ask and 2 principles to practice. Italics below describe how to link your client’s answers to your massage precautions. 1. Where do you experience the neuropathy? This is an area for cautious with pressure and joint movement. Whether the client’s neuropathy plays out as pain, impaired sensation, or impaired movement, be very gentle. Joint movement should be minimal. Typically the pressure used to apply lotion, “light lotioning,” is the maximum used, with good firm contact. Even if a client with impaired sensation argues for deeper work, stick to gentle pressure. The client may not be able to feel the pain that signals tissue damage, and pressure should be cautious. If you do increase your pressure, do so in tiny increments over many sessions, to learn the right pressure for the client. * Make sure you are following pressure guidelines for related conditions. Also, if the feet are affected, balance may be affected. Be watchful. 2. How does it affect you? How is it affecting you today? Symptoms of neuropathy call for gentler pressure and joint movement, as noted above. This is typically true no matter which symptoms are present: numbness, pain, or burning. If motor problems are present, caution is still advised. 3. What is the cause? Always adapt massage to the cause of the neuropathy as well as the neuropathy itself. Depending on the client’s presentation, massage modifications will be in force for most causes of neuropathy, such as advanced diabetes, chemotherapy treatment, and HIV disease. These guidelines are too lengthy to go into here, but you can find them in my textbook, Medical Conditions and Massage Therapy: A Decision Tree Approach or another massage and pathology text. 4. What is the condition of your skin in the area? Ask this question out loud, but also inspect the tissues each time you begin contact with the area. This is especially true of the feet. As in the story above, friction from a foreign body in the shoe, ill-fitting socks, and other irritants can go unnoticed. You’ll want to bring it to the client’s attention, for sure. To avoid causing infection, you will also want to avoid contact with broken skin, and avoid introducing lubricant into an opening. 5. How is it treated? How does treatment affect you? Drugs for neuropathy include low-dose antiseizure medications, pain relievers, and even tricyclic antidepressants. Usually side effects are mild, but it’s important to ask about them. Adapt massage to any side effects, which may include drowsiness, dizziness, and nausea. 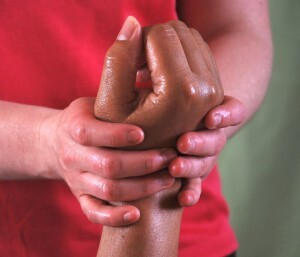 These 5 questions are essential for working safely with clients with neuropathy. 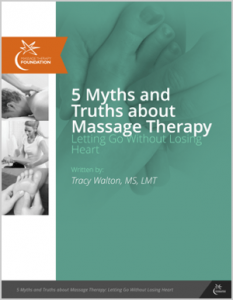 Questions 1 and 4 highlight our approach to massage when there is sensation loss. Because it’s easier to remember a handful of massage principles than a few hundred conditions, I offer a couple of principles here. Massage therapists follow this whenever sensation is compromised, whether from peripheral or central nervous system disease or injury. Another time-saving principle for nervous system conditions is applied when sensation is impaired or absent. The Sensation Loss, Injury Prone Principle states “If a client has lost sensation in an area, inspect the tissues carefully for injury before beginning the massage.” This principle captures our concern about open skin, identifying it early in the massage, and bringing it to the client’s attention. With the right questions and thought, massage can be easily adapted to peripheral neuropathy. Remember that neuropathy is often a complication of another condition such as HIV, diabetes, or chemotherapy treatment for cancer. With additional massage guidelines in mind for related conditions, massage may provide real support for a client who is living with neuropathy. * Pittsburgh-based MT Valerie Vogel tells wonderful success stories of massage for neuropathy. See Medical Conditions and Massage Therapy: A Decision Tree Approach, page 169-172, for a neuropathy decision tree and Valerie’s work with clients with HIV and neuropathy.